The Breakmate was supposed to revolutionize how we consumed soda, on par with the advent of the soda fountain and soda bottles, and bring delicious sugary soft drinks to millions of disenfranchised American office workers. So why did Coca-Cola's foray into small-scale commercial vending during the 1980s flop so miserably? It's not particularly hard to sell Coca-Cola in America, or anywhere for that matter; the global brand is valued just north of $167 billion. It's the number one soft drink in the US and has been for more than a century. But in the mid 1970s Coke began looking into a new potential market, one under-served by traditional, full-sized vending machines: small offices and commercial spaces with 5-50 employees. Coke's solution? The Breakmate, a refrigerated, table-top mini-dispenser about the size of a '80s microwave that mixed three Coca Cola syrup varieties (Coke, Diet Coke, Sprite) in the traditional soda fountain ratio of 5:1 syrup to soda water. 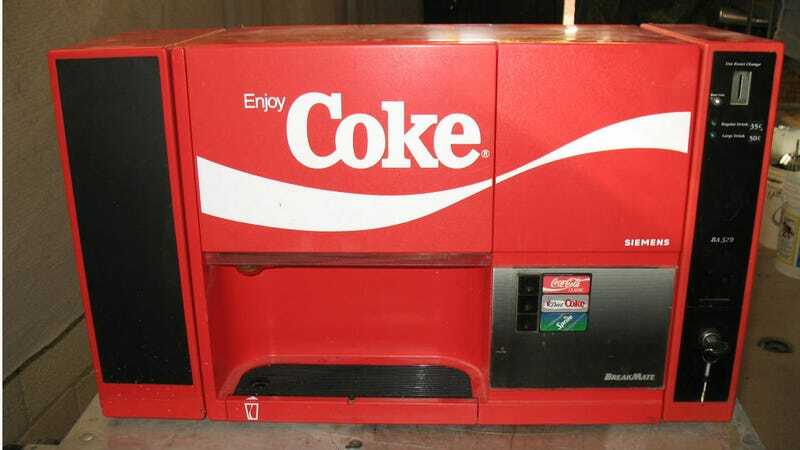 Coke teamed with Bosch-Siemens to develop the device, which was essentially an early version of the self-service soda fountains you find at fast food joints today. It was meant to sit right next to the coffee machine and become a fixture in offices across the country. "Coffee is a morning beverage, but soft drinks are an all-day option," said Ira L. Gleser, a Coca-Cola spokesman, told the LA Times in 1988. "And soft drinks are now the beverage of choice in America with people consuming about 45 gallons per capita annually. That's more than even tap water." And modestly terrifying from a public health standpoint, no wonder we're such a bunch of fatties these days. The Breakmate did receive a modest amount of attention when it debuted, being installed in roughly 20,000 locations in its first year. Coca Cola anticipated the system earning as much as two percent of the company's sales—roughly 20 million gallons of concentrate—annually. This did not happen. The Breakmate turned out to be an especially finicky device. The pour quality was wildly inconsistent, cross-contamination of soda flavors was an occurrence, and the devices themselves demanded near-constant upkeep to operate properly. And while the system was designed to deliver a 6.5 ounce beverage at an average cost of 25.6 cents, the service calls quickly turned the Breakmate from a money-maker to a money pit.